← Travels with Bowie and D.O.G. In April, I returned to Cerrillos, New Mexico after almost exactly a year away and it felt like coming home. I had originally planned to stay for a month, but I quickly realized I wasn’t ready to leave the Land of Enchantment and so I found a summer housesitting gig at a place called Garden of the Gods in Cerrillos. I did have one major reservation about staying for the summer: Rattlesnakes! My two previous stints in New Mexico spanned from October to April, when the snakes are hibernating, so I hadn’t had to worry about them. In the warmer months, however, this place is rattlesnake heaven and I was terrified of encountering one on my daily hikes, which often take me deep into the back country, far from help. I’ve dealt with a lot of potentially dangerous wildlife encounters while hiking (several black bears, a Grizz, an angry mother moose, charging wild horses, and a stalking mountain lion, to name a few) but the prospect of me or one of my dogs getting bitten by a diamondback scared me in a very primal way. First, I looked into the rattlesnake vaccine for the dogs and came away unimpressed. Most reports were tepid at best and a few expressed serious reservations about the effectiveness of the vaccine and the possibility of severe reactions to the shot itself. So then I looked into behavioral modification and quickly signed my dogs up for Rattlesnake Aversion Training. The training session, which was well attended by dozens of dogs and their owners in Edgewood, New Mexico, involved four stations: a muzzled juvenile prairie rattler, a freshly shed snake skin, a rattling noisemaker under a rock, and a large, adult diamondback rattlesnake, also muzzled (I asked the trainer: “How do you muzzle a rattlesnake?” His answer: “Very carefully”). The idea was to teach the dogs to associate the sight, smell and sound of a rattlesnake with a mild zap from a shock collar. Normally, I do not condone shock collar training, but I’d much rather my dogs learn their snake lesson by getting zapped a few times than by being bitten. I thought Dio might already be snake savvy, since he survived on his own for several months in the deserts of northeast Arizona desert before he joined up with Bowie and me. Bowie’s rattlesnake experience, on the other hand, was limited to investigating the funny noises coming out from under a rock on a hike in Virginia (I grabbed him away before he was bitten). In their training sessions, both dogs behaved exactly how I predicted they would: Dio wouldn’t go near any of the stations and Bowie endured several shocks at the first three stations before refusing to approach the diamondback. Hopefully, the lesson sticks. I also wanted to gain more rattlesnake experience for myself. Around here, it’s only a matter of time before you find a snake in your yard or even your house and I wanted to learn what to do ahead of time. 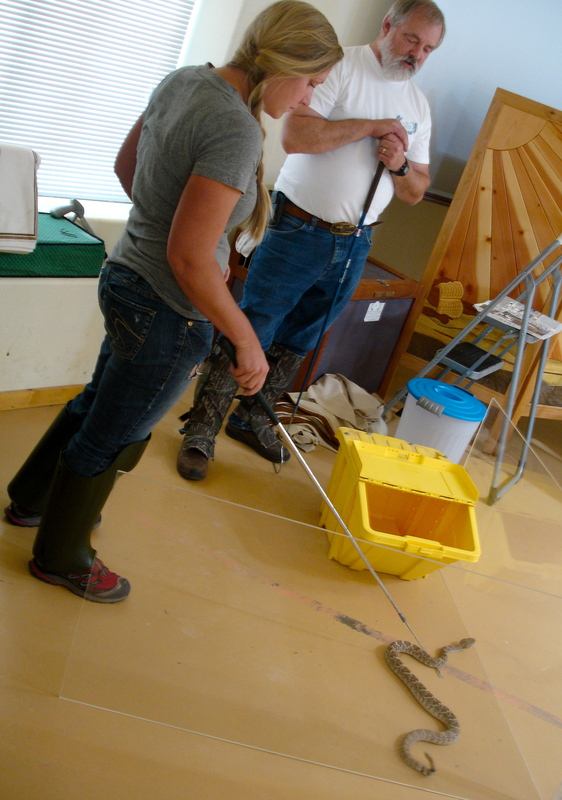 So I signed up for a Safe Rattlesnake Handling course through the Santa Fe Wildlife Center. The three hour class involved species identification, a written test and practice handling two wild-caught snakes: a prairie rattler and a diamondback. I came away from the class with my very own snake stick – a golf club with a blunt hook on the end – and much greater confidence in my abilities to deal with an emergency snake situation. Confidence is key. In exchange for attending the free class I am now on the Wildlife Center’s list of approved rattlesnake wranglers so when somebody from my area calls with a snake problem, they send me out to deal with it. The idea is to corral the snake, pick it up with the hook, place it in a plastic bin with a latching lid and transport it out into the desert where it can live out its life catching mice and avoiding people. I’m still waiting on my first snake call, but check out this video of me wrangling two rattlesnakes at the Wildlife Center! So far this summer, I’ve only encountered two snakes: a very large but harmless bull snake right by my house and a small but feisty juvenile diamondback on my driveway. Both times, the four dogs I was with (my two and two I was watching for friends) ignored the snakes. Update: I just heard one of my neighbor’s dogs was bitten by a rattlesnake right by their house over the weekend. She’s at the vet, getting antivenin and fluids and is expected to recover. Young, healthy dogs over 50 pounds almost always survive snake bites, but the treatment can be very expensive. Here’s hoping that I won’t have to make any snake-related emergency vet (or hospital!) visits this summer! This entry was posted in Bowie & D.O.G., New Mexico. Bookmark the permalink. 15 Responses to Rattlesnake Wrangling! I have also been researching the rattlesnake vaccine and figured out that the cost to get all 3 of my dogs vaccinated would end up being $400 (1 shot at $25 plus the $39.95 vet appointment for each dog = $195 and then I’d still have to go back for the booster a month later) which would be fine but it didn’t seem that the vaccine would be that effective if they were bit and I’d still have to pay some hefty vet bills. I haven’t been able to find anyone who has gotten the vaccine for their dog either. Let alone someone who had their dog vaccinated and then their dog was bit. 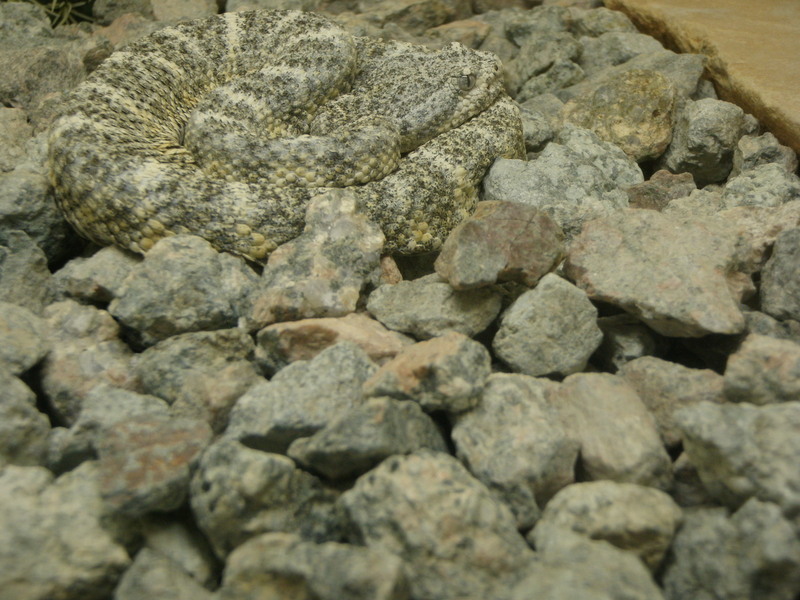 Although I do know several people who have had dogs bitten by rattlesnakes and they received little to no treatment (they didn’t know what was wrong and only later figured it out). So far every one of those dags has survived without receiving the anti-venom. My vet, in Tijeras, did tell me that last year they saw a dog who was bit on the tongue (eeek!) and the dog had received the vaccine. That dog recovered well but still suffered from the bite and required treatment. Yeah, the idea of my dogs getting bitten by a rattlesnake really terrifies me! From what I’ve learned, larger, healthy dogs almost always pull through without needing antivenin, which can run $500-$1,000 a dose. Yikes! Always keep Benadryl on hand at all times to help combat the swelling: dosage is 1 milligram per 1 pound of the animal’s weight 3 times per day (so a 50 pound dog should get 50 mg — 2 tablets — 3 times a day). Dogs that get bitten on the nose or face may have trouble drinking due to swelling in the days after the bite, so if that’s the case, it’s best to take them to a vet for IV fluids to help stabilize their blood chemistry. I’m hoping that preventative training and a lot of mindfulness will be the key to a bite-free summer! We’ve been getting up at dawn for our daily walks and I carry a walking stick, and stay relatively close to home. I’m looking forward to cooler, snake-free weather already!